Binalong Bay is a delightful seaside village conveniently located just 10 minutes drive North East of St Helens. On the shores of Georges Bay, St Helens is a picturesque fishing port and the largest town on the East coast. 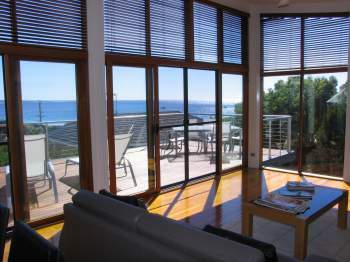 Villa Vista is located in the heart of Binalong Bay with sweeping views of the coastline beaches renowned for its white sand and red granite rocks, giving it the acclaimed name of ‘Bay of Fires’. 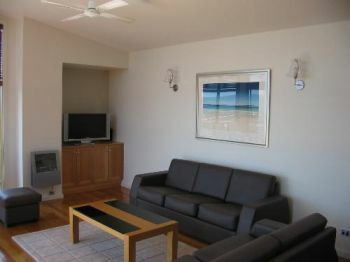 This beach house is an easy two minute walk to the beach, and a three minute walk along the Main Road to the well-situated Bay of Fires Cafe. Villa Vista is a modern two storey self-contained beach house with upstairs featuring a master bedroom with separate bathroom, kitchen, dining and living area, and generously proportioned deck with outdoor furniture and gas barbeque. The downstairs area has two queen size bedrooms, separate bathroom with laundry integrated, separate living room and deck. Activities offered in the area and surrounds include: water based activities; canoeing; kayaking; sand boarding; scuba diving; beach, game and deep sea fishing; golfing; tennis; bushwalking; cycling. Accessible noteworthy locations for a full or part day road trip from Binalong Bay include: Pyengana Dairy Company (renowned for its cheese) and Holy Cow Café (approx 30 mins NW); St Columba Falls and State Reserve (approx 40 mins NW); Eureka Fruit & Berry Farm, acknowledged for its wonderful jams, sauces and ice-creams (approx 20 mins Sth); Captains Catch, wonderful fish and chips on St Helens wharf; Doherty Resort in St Helens overlooking Georges Bay; Freycinet National Park, Wine Glass Bay, Coles Bay (approx 60 mins Sth). 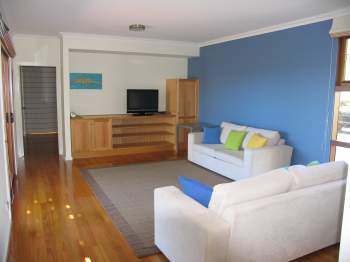 A beautifully appointed self-catering beach house with stunning beach and ocean views. This option is for one to two people. 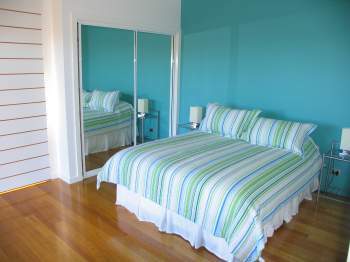 Couples can enjoy the master bedroom, or friends travelling together may take advantage of their own queen bedrooms. This contempory two-storey beach house has the main bedroom on the upper level, with a separate bathroom, the fully equipped kitchen (consisting of oven, cooktop, microwave, refrigerator/freezer and dishwasher) is open plan with the dining and living area and opens out to a spacious balcony where you can enjoy al fresco dining with barbeque facilities, and enjoy the spectacular views. This option is for up to six people travelling together staying in our three queen bedrooms. This option is ideal for two couples travelling together or four friends who'd like to share our three queen bedrooms. There are two queen size bedrooms on the lower level, a separate bathroom with integrated laundry, and a large living area opening out to a balcony.